When it comes to curb appeal it’s all about the first impression… but what does your front door say about you? Red is the colour of passion. It is vibrant, lively and exciting and so too is the person behind the door. People who choose to paint their front door red are often some of the most welcoming and hospitable souls, delighting in entertaining and having guests. This explains why traditionally, red has represented a hospitable home. Orange is the colour of warmth. It is an expression of energy, happiness and confidence. A blend of the primary colours red and yellow it represents a mixture of the qualities associated to each; the happiness of yellow and the boldness of red. People who paint their front door orange are often social butterflies. They love to entertain and certainly don’t shy away from the challenge of playing host. Yellow is the colour of logic. It represents the left side of the brain responsible for critical thinking and original thought. As the lightest colour in the spectrum it also inspires feelings of cheerfulness, fun and positivity. 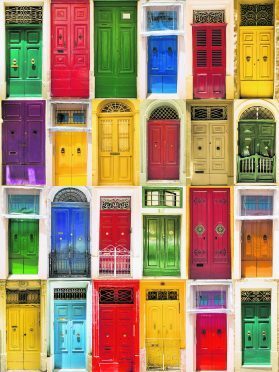 The person living behind a yellow door is going to be both logical and lively with lots of vitality for life. Green is the colour of health and wealth. It is tranquil and traditional. With the combined power of representing health and wealth, the individuals living behind the green door are often successful and ambitious. They value the well-being of their family as well as working hard and self-improvement. Someone who chooses to paint their door blue will value the peace and tranquillity it brings and will view their home as a place of refuge from the pressures of the outside world. Purple means extravagance. It reflects wealth, fantasy and risk. It is no surprise then, that the person who picks purple is more than comfortable taking a risk or two. They will also enjoy the finer things in life, indulging in treats and pleasures where ever they can. More than that though, the person behind the purple door will dream big and even consider themselves free spirited. Pink is the colour of love. A mix of red and white it blends the qualities of these two colours. The passion and boldness of red is softened by the purity of white making it romantic, loving and thoughtful. As you may well guess then, the person living behind a pink door is the neighbourhood’s hopeless romantic. They will make a good partner and a great friend thanks to their caring nature and thoughtfulness. Brown is the colour of earth. It is warm, stable and organic. Whether painted brown or natural wood, the person behind this door will share the same characteristics as the colour. They will be grounded, down to earth, warm and friendly. However, should the shade of brown be on the darker side of the spectrum then it could reflect a more private soul, looking to avoid too much interaction with the outside world. Black is the colour of sophistication. It is classic, authoritative and stylish. Paining your front door black makes a bold statement. It tells the world your home is a place of order and control. That means the person living behind the black front door is likely to have a place for everything and everything in its place. They are a strong, sophisticated person of substance and style. Grey is the colour of contentment. It is calm, practical and reserved. Being a mix between black and white, grey can also be considered the colour of indecision and even indifference. The person who has a grey front door will be looking for a quiet life. They don’t like to stand out too much and are happy making the compromises often demanded by modern life, to ensure stability and balance in their lives. White is the colour of perfection. It represents wholeness, equality and perhaps surprisingly, creativity. White is the sum of all colours in equal measures and that’s why it has connotations of wholeness and equality. Like the colour, the person living behind the white door will be someone who is very fair. They will be open to all sides of an argument, carefully balancing each side to arrive at a fair resolution. They are also likely to be highly imaginative, able to fill the blankness of white with ideas and creativity. Like the material itself, the person behind the glass door has nothing to hide. They are friendly, outgoing and open.